Cure Kodlak's spirit and become leader of the Companions. The Companions and the citizens of Whiterun bid their goodbyes to Kodlak. Have Eorlund Gray-Mane mend Wuuthrad. Return Wuuthrad to Ysgramor's Tomb. Make your way through the tomb. After the events of Purity of Revenge, Vilkas will run towards the Skyforge to participate in the late Harbinger Kodlak Whitemane's funeral. The ceremony is to be held near Eorlund Gray-Mane's smithy. All of the Companions will be present, along with the Jarl, steward and the local priestess of Kynareth. 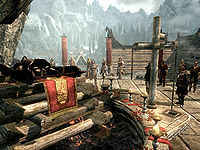 Kodlak is placed above the forge, and the ceremony ends with Aela the Huntress lighting the fire, symbolizing a final goodbye. After the ritual, Eorlund will seek you out, asking for the fragments of Wuuthrad and Kodlak's secret fragment from his chambers. Retrieve the fragment from the end table in his room. Kodlak's Journal, also in the end table, offers some insights on him and his visions. Return to Eorlund with the fragment. When he accepts it, he will inform you that your Shield-Siblings have gone to the Underforge for a gathering and suggests you join them. 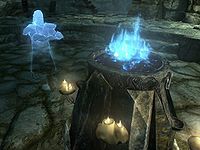 You will find the three members of the Circle, Farkas, Vilkas and Aela, talking around the blood fountain. They will agree that Kodlak's death was avenged but his soul now belongs to Hircine, and is destined to hunt in Hircine's Hunting Grounds forever, rather than his desired afterlife in Sovngarde. While they regret the events, they can see no solution until Eorlund Gray-Mane enters with the repaired Wuuthrad on his back. He will quickly announce that it is entirely possible to grant Kodlak his final wish and hand Wuuthrad to you. Your allies will then take off towards the legendary Ysgramor's Tomb. As soon as you enter the tomb, Vilkas will approach and warn you about the dangers that lie ahead. He also says he will take no part in the task, as he has too much grief in his heart. Activate the Ysgramor statue, which will take Wuuthrad from your inventory, and place it on the statue to lower the wall. You may reclaim Wuuthrad by activating the statue again, and the wall will remain open. Followed by Aela the Huntress and Farkas, two skeevers greet you as you head north into the tomb. Continue down, and follow the path around until you are heading west into the next chamber with several Companion ghosts who taunt and warn of your impending death. They attack with Ancient Nord Bows, Swords, and Battle Axes, but their loot will disappear quickly if not searched immediately. Now head south until you enter a large room, with more tombs encircling a pond. Here one or two more ghostly apparitions test your courage before moving deeper into the tomb. Going west up the small stairs past the tombs, you encounter a spider web to the south that must be broken through to continue. It is here that Farkas reveals that, "Ever since Dustman's Cairn, the big crawly ones are my weakness". Consequently, he will proceed no further and instead runs back to join Vilkas at the statue. With Aela the Huntress as your only ally now, hack your way through the spider webs and face a Giant Frostbite spider, and many poison-spitting frostbite spiders. Follow the stairs down past the white caps into the next area. Two more companion ghosts await you, and after finishing them off, search the Draugrs laid out on the tables for valuables, and a potion of stamina beside the wrapped body. Be sure to search the Draugr skeletons in their tombs for leveled weapons and armor. Heading east up the small stairs, open the next iron door and you'll enter an area with Draugr tombs to your right, but a closed gate to your left. Activating the pedestal will open the closed gate. Enter this chamber heading north, where four more ghosts await shooting arrows, and wielding both one and two-handed weapons. Dispose of them, and find the Two-handed skill book The Legendary Sancre Tor in the center of the room next to the burial urns. Up the stone stairs and through this final iron door. You will find the ghost of Kodlak Whitemane warming his hands near the Flame of the Harbinger. After explaining that the room is, in fact, swarming with the ghosts of his predecessors, whom you can't see, he will ask you if you still own the Glenmoril Witch heads. He will then ask you to toss one into the Flame, in an attempt to cure him of his werewolf curse. After doing so, Kodlak's wolf spirit will be released and immediately attack. After the battle, Kodlak will thank you and name you the new leader of the Companions. He will then travel to Sovngarde and finally find his peace, completing the quest. You can now speak to Aela, who will recognize your new position and tell you she is going to stay in the tomb for a while longer, for further studies. If you linger there, Vilkas and Farkas will arrive and also say they want to stay. All three will then become available as followers. You can cure yourself of lycanthropy before you leave the tomb if you wish. If you don't, you will be required to cure two other Companions of their lycanthropy before you will again have the option to do so. 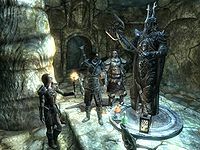 Consider that choosing to remain a werewolf is the only way to access the quest Totems of Hircine, which grants unique abilities you may use while in beast form. You may come back to cure your lycanthropy later. To cure yourself now, throw another Glenmoril Witch head into the fire. Your wolf spirit will emerge. Kill it to rid yourself of being a werewolf permanently. If Aela, Vilkas or Farkas are around, they will aid in the fight. 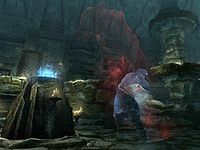 After you've finished, continue up the spiral wooden stairs and locate the chest on the northeastern ledge to claim the Shield of Ysgramor, along with some other valuable loot, then exit through the nearby door by activating a chain. Go up the stairs, and through another short hallway before arriving at another wall with a chain. Pulling the chain opens the wall to the first chamber in the tomb as well as the wall on the opposite side. Before leaving the tomb, you can take Wuuthrad from Ysgramor's statue if you didn't earlier. Exit the tomb through the western passageway, which was previously inaccessible. Follow the set of stairs outside up the mountain to discover a word wall which teaches part of the Animal Allegiance shout. Directly north (to the right) of the word wall is a gold ore vein. Neither of them will enter sneak mode when you do, and when either can see you, the sneak eye remains open. If you get too close to them while sneaking, they will yell "Stay away from me!" as if you were going to pickpocket them. Accidentally attacking either of them might turn them hostile. Aela, Farkas, (and Vilkas after he speaks to you at the entry) will only repeat "For Kodlak!" during the quest, and won't have any dialogue options, including skill training. You can bring any other follower with you and they will help clear the tomb. However, at the final fight they may ignore Kodlak's wolf spirit as if it were invisible to them. If you choose to cure yourself, they will fight your released spirit normally. To start the quest, first select Eorlund and enter kill in the console, followed by enter setstage C06 0 and finally resurrect. Kodlak's ghost may not appear when entering the final chamber. Using the console command setstage C06 60 will allow you to put the witch's head in the fire, at which point Kodlak's wolf spirit will appear. After defeating the spirit, Kodlak may still not appear, at which point the console command setstage C06 200 will end the quest as usual, with Aela exclaiming that she heard Kodlak pronounce you leader. If you leave the Underforge while the circle is talking after the funeral, the dialogue may not continue when you return. 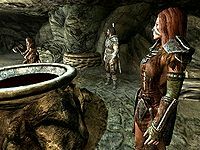 If you follow the Circle members heading to Ysgramor's Tomb after Wuuthrad has been assembled, the group may eventually get stuck running back and forth between Dawnstar and the mountain range about halfway towards Driftshade Refuge. 10 I should attend the funeral of Kodak Whitman [sic], the late Harbinger of the Companions. 15 Eorlund needs the fragments of Wuuthrad to prepare them for remounting in Jorrvaskr. 20 As a member of the Circle, I need to convene in the Underforge to determine the next steps for the Companions following the death of Kodak Whitman [sic]. 200 Finishes quest I helped grant Kodlak Whitemane the glory of Sovngarde, and took his place as Harbinger of the Companions. On the PC, it is possible to use the console to advance through the quest by entering setstage C06 stage, where stage is the number of the stage you wish to complete. It is not possible to un-complete (i.e. go back) quest stages, but it is possible to clear all stages of the quest using resetquest C06. This page was last modified on 6 March 2019, at 02:33.